Why not a Shih Tzu puppy shower? 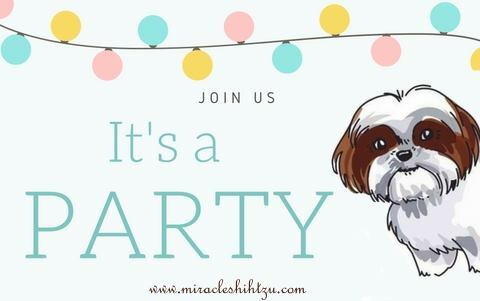 Whether it is you who is expecting a new puppy or dog soon or someone you know, planning a party to celebrate the new arrival is often a great excuse to bring friends together – human and canine ones. 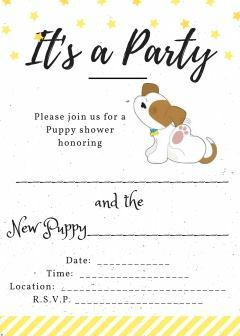 For those who have either chosen to substitute parenting a child for adopting a puppy or those who want to do it all, a puppy shower is a welcoming event. Not only is it a very good time to see old friends, but the cute gifts one receive can be very welcoming. And, who really needs an excuse to throw an office party. Start planning early. Remember human pregnancy lasts 9 months, but doggie pregnancy only lasts 9 weeks. Puppies generally stay with their mother until they are 8 weeks old. But many puppy buyers do not find out about puppy availability until well after they are born. Planning the festivities to occur before or after the puppy is in their new home will dictate how to proceed. 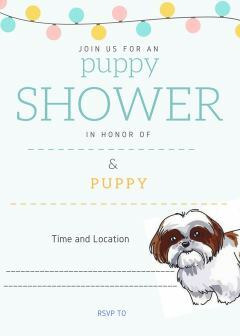 If the shower occurs before the big day, it can be a people only event that will honor and help the new puppy owner. Having the event take place at some point after the puppy has settled into his/her new home means that canines can be included in the guest list. This could be a great opportunity for puppy socialization if done without too much fan fair. A small group of dog lovers coupled with one or two well-chosen adult dogs can make the party a great success. Too much of a good thing though can terrorize a new puppy. A Shih Tzu Puppy Shower can be as elaborate or simple as you like. Invitations, Decorations, Simple Foods and Drinks all make for a great party. Add a couple of games and of course, gifts and you can proclaim your party a success. Anything more could be considered the proverbial icing on the cake. There aren’t any real rules when it comes to Puppy Showers, and no rules of petiquette have been established as far as I know. So, feel free to be as creative as you like. A printed invitation adds a touch of festivity and eloquence to any shower. There are many ways to do this. If you are creative, design your own and print off as many copies as you need. If you are short on time, feel free to use one of my designs. Just click on the picture of the one you like and a larger pdf version will be ready for you to fill in the details. Here are a couple of free ideas for you to print and save. Click on the picture for a pdf version ready for printing. The inspiration for decorations can come from baby showers. Think pink and blue if you are more traditional or let your imagination go wild with all sorts of colors. Include balloons, streamers, and color-coordinated tablecloth, napkins, and paper products. Decorate with dog bones, fire hydrants, and paw prints. A good alternative to confetti is to purchase a supply of inexpensive dog bows to spread around on the table. Encourage everyone to help themselves at the end of the party. What's a Shih Tzu without a hair bow? If you have ever taken a Carnival Cruise, you will recall that folded towel creations is all part of the experience. If those who have not, let me explain. Each evening while onboard, the stateroom steward folds a towel or two into a unique creation such as a money, elephant or dog. This video describes how to make a folded dog. Yes, they really do exist and there are many different types of memory books from which to choose. Books normally includes space for photos and details such birth information, milestones, and memories. Leave it out so everyone can jot down a great tip for the new puppy parent. 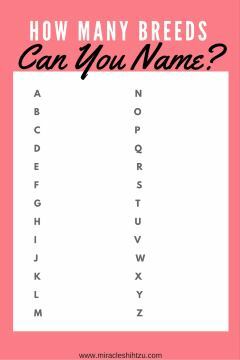 You can also use it to encourage people to suggest great puppy names if the pup has not already been named. What is a party without food? For those who want to include a canine or two, including them in the menu preparation is a must. Simple canine cookies and treats will be a big hit among those four-legged guests. For their human parents, consider a cake, cupcakes or some tasty finger foods that may also be shared with the dogs. Avoid chocolate, nuts or avocado. If you want something, just a little more nutritious, perhaps a carrot cake may be a good option. Good choices include fresh veggie sticks, yellow or white cupcakes, sugar or shortbread cookies. Remember small dogs don’t need extra sugar, so a little bite goes a long way. If you are not familiar with foods that dogs should not eat, check out the list here. “Puppy Chow for people can be served in dog bowls and can include dried fruits (no raisins if dogs will be nibbling), and Chex mix. Once everyone is chowing down, they are likely to be thirsty. A champagne toast is always a nice touch, but a simple punch will also do. Don't forget your doggie guests. Place bowls of clean cold water for dogs to enjoy. Encourage everyone to list a dog breed that begins with each letter of the alphabet. What’s a party without a game or two? Cut out pictures of dog breeds especially rare ones and paste onto index cards. Give each person a piece of paper and a pencil. Show each dog breed one at a time and have everyone jot down their answer. After all breed pictures have been shown, give out the answers. The person with the most correct answers wins a small prize. If the puppy doesn’t have a name yet, ask everyone to consider a name and why it would be a good name. Ask everyone to add their suggestions to the puppy book. Give everyone a piece of paper and a pencil. Using a timer for a set amount of time, say 3 or 4 minutes, have everyone jot down as many breeds as they can, one for each letter of the alphabet. Game winners deserve a little prize. Depending on your guest list, you will want to decide whether the prizes should "go to the dogs" or be more appropriate for the two legged guests. If everyone attending already has a dog, a nice idea for prizes would be to pick up a few trinkets they could give to their dog: treats, chews, small toys. If your guest list includes some without pets, then the prizes should be appropriate for people: Small bags of candies or nuts, notepads, hand cream, etc. 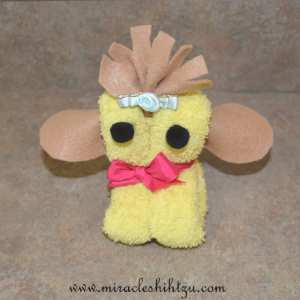 A cute little party favor that is simple and very inexpensive is to make each guest a washcloth Shih Tzu. If your guest of honor has never had a dog before, she or he is going to need quite a few supplies. Anything from bowls and leashes or puppy treats and doggie combs will all be most appreciated. Toys are always a great idea as are cute little dog sweaters or even boots if it is wintertime. 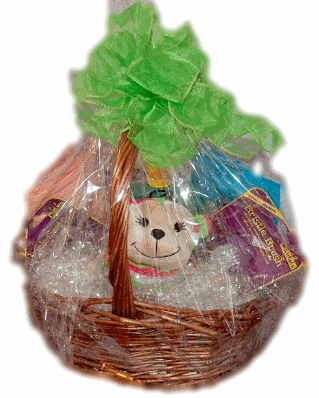 For something a little more creative, why not purchase or make a puppy basket with a variety of items for the puppy parent to be. If you'd like to make your own, there are detailed instructions on how to do so. How to make a Puppy Basket. Have a Great Idea for this Shih Tzu Puppy Shower Page? Have you ever received or given a Puppy Shower? Why not share your experience and ideas. We'd love to hear from you. Tell us about your party or if you have a great idea for a party, this is also the place to post. Remember to upload some pictures if you have any.